Each staff member goes through an intensive eight-day training program before the campers arrive. Areas covered include preparing for and reacting to emergencies, first-aid, and general camper health and well-being. Parent: What is the ratio of campers to counselors? Jon: The ratio of campers to counselors is 2.5:1. 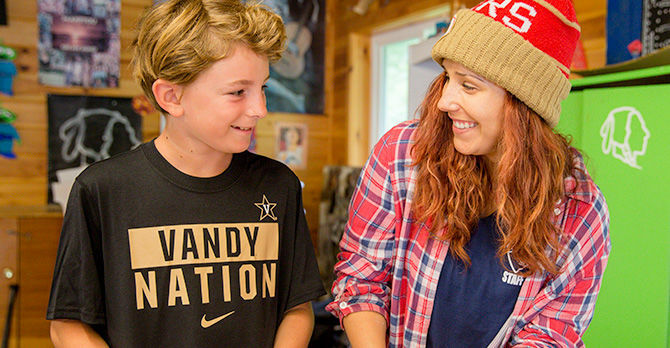 Cabins for boys ages 10 and under have at least 3 male counselors and 1 female counselor assigned to each cabin with 10 campers. adjustment of being away from home – especially for first-time campers. She spends time with the cabin during the day and at night before bedtime but does not live in the cabin. Parent: What are the cabins like? on duty in the cabin at all times so the campers are never left alone. Parent: As I investigate summer camps, one of the questions I have is whether it will benefit my son to go to a boys-only camp. Jon: That’s an excellent question to consider. We believe there is a real benefit to campers. We live in a co-ed world. At Manitou there are no romantic distractions and no pressure to impress the girls. We nurture boys as boys within an encouraging environment. When a boy comes to Manitou he interacts with men who are strong and assertive, but they are also attentive, compassionate, and supportive. He experiences something unique: he can be himself, his whole self. At the end of the summer he reenters the co-ed world with renewed confidence.